I love most spectator sports, but baseball is my passion. My dad began instilling this in me over fifty years ago on a hot summer afternoon in Griffith Stadium, a place that no longer exists. That day our Washington Senators were pounded unmercifully by the hated New York Yankees. My second experience that same summer was no better, as the Senators fell by almost the same score to the Cleveland Indians. Our team was not only bad, but comically incompetent. I distinctly remember two infielders running into each other trying to catch a routine pop-up. The manager was so angry that he wouldn’t speak to either player after the game, even to ask if they were hurt. Griffith Stadium was not very kid-friendly. There were always poles blocking my view. I must have gotten tired and whiney, but we stuck out those brutal games. I guess my dad wanted me to learn that the joy of victory doesn’t mean much unless you also know the tiresome futility of losing. Besides, we had our own heroes─definitely not the caliber of Mickey Mantle or Mudcat Grant, but at least Harmon Killebrew and Camilo Pascual were our own. It’s always been more futility than joy for D. C. baseball fans. Two Senators teams departed, spurred by almost criminally bad owners. The first of these teams was just beginning to improve when it was snatched away. I remember listening to the radio one evening as the Senators trailed the enemy Yankees by 5-0 in the late innings. Then our team miraculously erupted for three runs─only to see the rally washed out by a torrential rain. God was cruel that night, but announcer Bob Wolff’s excited, sympathetic descriptions made it an experience nevertheless. There was a gap of 34 years between the departure of the last Senators team and the arrival of the current team, the former Montreal Expos, now the Nationals. The romance of the game endured, fostered by its very absence. In the seven years they’ve been here, there have been many obstacles to overcome: a farm system left to die on the vine before the move; no genuine ownership or cable TV contract during their first two years; inadequate facilities until a new stadium was built; a prolonged fight between the City Council and Major League Baseball over funding for that stadium; the absence of a strong fan base because of all these issues. Still, every season brought moments to savor. Now our Nats are finally starting to look like a team, but that doesn’t guarantee success. It has yet to happen on the field, day in, day out. The modern new ballpark contains echoes of the ones that are gone. Old or new, ballparks are enchanted realms where the bad outcomes feel like tragedy and victories are sometimes miraculous. Grown men play the game with the exuberance of boys. It’s basically the same game they played in Little League. That belies the tremendous skill and discipline it takes to succeed at it. Baseball marks the seasons of the year. Opening Day means spring, even when the freezing temperatures require winter coats and heavy doses of hot chocolate. The year moves on quickly to hot summer afternoons and warm evenings that bring the thirst-quenching taste of cold beer. 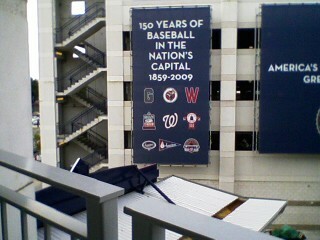 Then there’s the fall classic (only a pipedream in D. C. so far). Summers fade away and leave their sweetest memories behind. There’s nothing more magical than the nation’s pastime.